In ‘Scientific American’ of February 23 1907 in the article ‘Recent Performances Of French Hydroplane Boats’ an important problem was described: ‘In the early days of the hydroplane, inventors were handicapped, since they had only the steam engine available for the purpose, and thus a heavy weight had to be lifted, a weight which was out of all proportion to the power which the motor would give’. One year later, in 1896, Charles de Lambert changed his own steam-engine (which of course was much too heavy in proportion to the power supplied) for a Gottlieb Daimler petrol-motor. Above-cited article in ‘l’Aérophile’ of August 1935 further reports on the first trials with a self propelled hydroplane again on the Thames with a speed of 38 km/h. 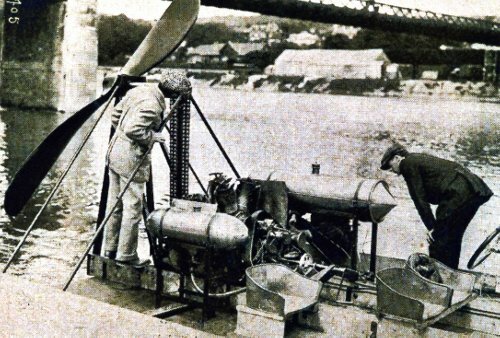 On May 11 1904 de Lambert tested, on the small branch of the Seine in Puteaux, a new hydroplane for the propulsion of which he made use of a ‘De Dion-Bouton’ 2-clinder motor of 14 HP which with a weight of 800 kilogram (pilot inclusive) at 1.000 RPM reached a speed of 32 km/h. On May 19 1904 the magazine ‘LA VIE AU GRAND AIR’ writes on its front page that “Toutes les données nautiques sont bouleversées”, all nautical theories have been overthrown. The article also reports that Charles de Lambert, forever perfecting his discovery, constructed the first real hydroplane in 1906 which, propelled by an airscrew and equipped with the famous 45 horsepower ‘Antoinette’motor, reaches on water – fabulous for that era - the speed of 60 km/h. The regions of the port of Monaco are the theatre of the most important international meeting in the competition of aquatic sports with very fast motorboats in the period from 1904 until 1914. This test bench, unique in its kind, welcomes not only motorboats but also ‘gliders’ and even the first seaplanes. In 1907 the team of count de Lambert, strongly represented with several units, creates a sensation with his hydroplanes with air propeller which he navigates himself during the match. There Charles de Lambert wins the Coupe put up by the newspaper l’Auto. De Lambert also takes an interest in air navigation and, for the fun of it, in this period namely on October 28 1908 he had his first flying instruction in Le Mans. See Chapter 6 ASPECTS WITH THE AVIATION UP TO 1908 INCLUSIVE. 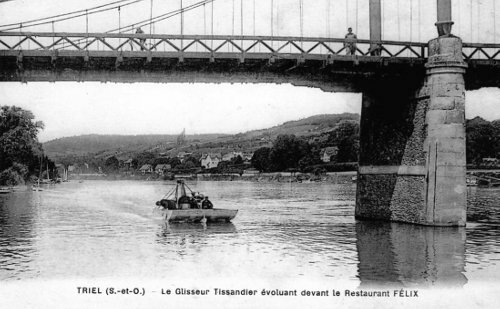 On July 26 1913 with a hydroplane called ‘Flyer’ equipped with a Gnôme motor of 160 HP navigated by Paul Tissandier - in Triel-sur-Seine where, close to the pier of the old toll bridge on the left bank Charles de Lambert and Paul Tissandier are having a little Bessoneau shed to test their boats and to construct prototypes of seaplanes - the speed of 90 km/h on one kilometre was reached. However ‘Automobile Club de France Commission du Yachting Automobile’, cannot confirm the record because it is not a public test. In an article from the hand of P. James, Ingénieur civil des Mines in ‘l’Aérophile’ of September 1 1913 the hydroplane is commended and an ingenious detail is brought up: ‘every float has been filled with bags of kapoc. It is known kapoc can carry about 30 times of its own weight on water.’ Taking into account the ratio weight boat/kapoc ‘the vessel may have all floats punctured without sinking’. The magazine also writes about several French and foreign colonial personalities who ‘did not conceal their admiration’.